Wine, glorious wine. We crave a glass after a tough week (day) at work, we slurp its deliciousness down with (almost) every meal and we dream about it on most weekends (before bathing in it on a Saturday night). While there’s nothing wrong with opening a bottle with your bestie on a Sunday arvo, it’s still kind of nice to swap your comfy onesie for the dimly-lit sultriness of a wine bar in real life. Here are Perth’s best wine bars. It's safe to say that everyone who loves wine and cheese, along with gorgeous interiors will love Petition Wine Bar & Merchant. You'll find a carefully curated list of food-friendly, artisan wines and plenty of them are made using biodynamic and organic practices; which means no hangovers (we hope). The food at this Perth wine bar is also on point, but if you're after something substantial, we'd suggest heading there for a little pre-dinner fun and then head next door to Petition Kitchen after. 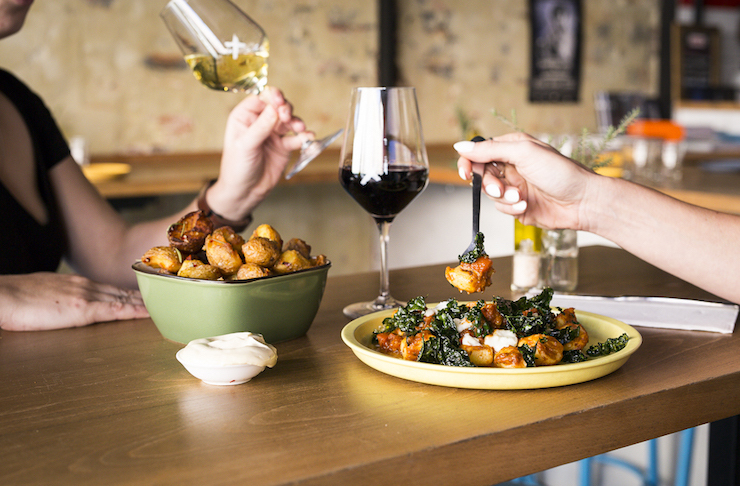 This community-focused food and wine bar in Subi is dedicated to reducing waste and offers a sustainable dining experience. New Normal has an impressive wine collection, including sparkling, reds, whites and more importantly, orange reds. Lalla Rookh is one of our favourites for a night of great food and great vibes, but did we mention they’ve also got a great wine room? Okay, we’ll stop saying great. But seriously head on down to their wine room which is lined with bottles from all over the world and get yourself a bite to eat from their delicious Italian menu. Shadow Wine Bar in Northbridge oozes class and elegance, and their wine list will impress even the biggest wine snobs out there. Whether you're looking for a cheeky glass and a snack from the bar menu or you want to go all out and make a night of it, Shadow will not disappoint. Ask your waiter for help pairing your food with the wine, or your wine with the food; whatever order you prefer. Northbridge wine bar No Mafia is one of our favourite spots in all of Perth. 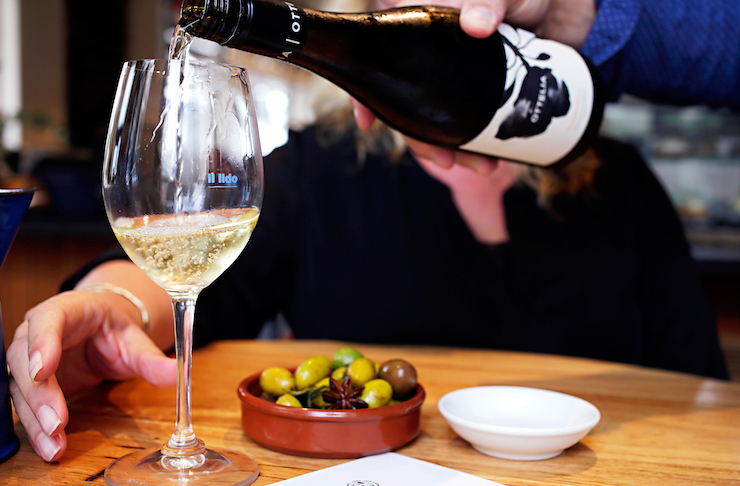 The wine list is full of Italian and Australian drops which pair perfectly with their epic antipasti menu—the white anchovies are not to be missed. While you're there, you should also get the triple cooked potatoes, because, well, potatoes. This little slice of Paris will have you saying ‘oui’ when you see their expertly curated wine list, matched with a French provincial and seasonally driven menu by renowned chef Russell Blaikie. Whatever you’re there for, you can’t go wrong with a visit to Must Winebar. Separating their wine list between light and easy, funky, wild and curio, round and rich, earth, spice and structure, and bright and juicy; a visit to Strange Company is a win for the old wine palate. Did we mention they've got wine on tap too? Educating Perth on the deliciousness that is natural wine, Wines of While definitely deserves its spot on this list. The vibe is casual, the wine is fancy and the food is second to none. As soon as we got wind of this gem, we rushed over to Los Bravos to try the wine, more specifically the ‘Tremendus’, a red and white mix from Spain. What else did we love? The record player that spins vintage Spanish tunes, the handmade plates and gorgeous décor and the mountain of freshly made paella. Serving up some of Perth’s most delicious glasses of vino, Si Paradiso will have you ditching the individual glass and grabbing a bottle or two. While we do love a good Prosecco, there’s no going past the Le Coste ‘Litrozzo’; perfect for sharing. Home to over 300 internationally and locally sourced fine wines, Tiny’s is the ultimate bar for self-proclaimed wine connoisseurs. With the option to buy by the glass or bottle, you’ll be able to try every wine on this extensive menu. Luckily the food here is also delish, and pairs perfectly with a glass or five of red. From 5 to 6pm Monday to Friday, Clarences is where you want to be if you want to catch an $8 wine by the glass; and yes, it's actually good wine. Never before has quality wine been so affordable or delicious in Perth. A well-loved fixture on Cottesloe Beach, Il Lido already stands as one of Perth's best Italian restaurants, but in case you weren't aware, you can go for a drink without ordering a meal. The wine they are pouring is absolutely top notch. A contemporary take on the 1950s late-night lounge bar, Halford Bar celebrates both old and new in the world of winemaking, with a list of 50 plus wines to peruse with fervor. We recommend one by the bottle so you can watch it be elaborately decanted. The second venture from the team behind Strange Company, Ronnie Nights is all about boutique wines from up and comers who you might not have heard of before. This wine bar is stunning, giving you all the more reason to stay all night long. Still thirsty? Here are The Best Perth Bars You Should Have Been To.